Indian Engineering Services (IES/ ESE) is a competitive examination conducted by the Union Public Services Commission (UPSC) for recruitment to the Indian Engineering Services. These engineers then work under the Government of India to manage a large segment of public sector economy which includes Railroads, Public works, Power, Telecommunication etc. The examination consists of three stages- Objective type, Conventional type and Personality test and only those who qualify all the stages will be included in the final merit list. The exam is divided into 3 stages- Preliminary Examination (Stage I), Mains Examination (Stage II) and Personal Interview (Stage III). The Preliminary and Mains Exams are conducted only through offline (pen and paper-based) mode. The date for the preliminary test was on 7th January, 2018 and the date for the mains examination is on 1st July, 2018. The questions for preliminary test are objective in nature while for Mains exam is conventional in nature. The exam is conducted only in English medium. It will consist of two papers of 200 and 300 marks respectively. Both are in offline mode and are objective type. Paper 1 has questions from General Studies whereas Paper 2 is specific for different Engineering disciplines (Civil Engineering/ Mechanical Engineering/ Electrical Engineering/ Electronics & Telecommunication Engineering). Each correct answer will have one mark and for each incorrect answer, one-third mark is deducted. The total duration is 5 hours and total marks is 500. Candidates who qualify Stage I will appear for Stage II. It will consist of two papers of 300 marks each. It is conducted in offline mode and is written type. Both the papers will have questions from the selected Engineering discipline (Civil Engineering/ Mechanical Engineering/ Electrical Engineering/ Electronics & Telecommunication Engineering). The total duration of both papers is 6 hours and maximum marks is 600. Candidates who qualify both Stage I and II will appear for Stage III. It is of maximum 200 marks. Candidate must be an Indian citizen or a subject of Nepal / Bhutan. A Tibetan refugee who came over to India before the 1st January, 1962 with the intention of permanently settling in India, or a person of Indian origin who has migrated from Pakistan, Burma, Sri Lanka or East African countries of Kenya, Uganda, the United Republic of Tanzania, Zambia, Malawi, Zaire and Ethiopia or from Vietnam with the intention of permanently setting in India are also eligible provided they have a certificate of eligibility issued by the Government of India. The candidate must be at least 21 years of age and must not have attained the age of 30 years on the 1stJanuary, 2018. Relaxation is given for government servants for 5 years, SC/ST for 5 years, OBC for 3 years and for physically handicapped and disabled for a period of 10 years. The candidate must have a degree in engineering from a recognized University or equivalent. M.Sc. degree or its equivalent with Wireless Communications, Electronics, Radio Physics or Radio Engineering as special subjects also acceptable for certain services/posts only. Physical Standards and Medical Examination are also done for qualification of the candidates for eligibility. The applications form for IES was available since 27th September, 2017 in the online mode. Last date of submission of the application form was on 23rd October, 2017. A student can apply through only through online mode.The application fee is Rs 200 for General Category and OBC whereas candidates belonging to the SC/ST/Physically handicapped and female category do not have to pay any fees. The candidates can submit the fees either online or offline. Online mode: Pay the application fee via SBI Net BankingDebit Card/ Credit Card. Offline mode: Submit bank challan of INR 200 at the nearest branch of State Bank of India. After successful registration, a registration number and password is generated. It has to be noted down for future reference. 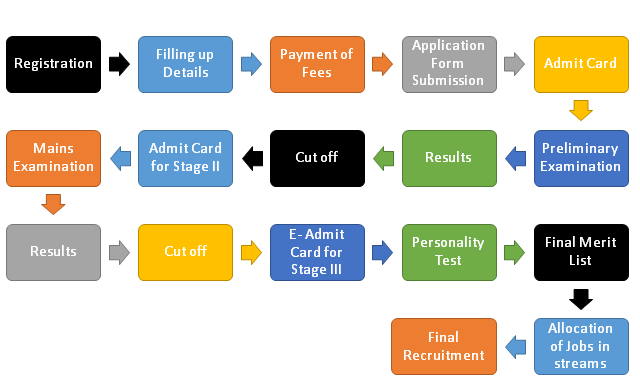 The completion of registration is communicated on mobile number and e-mail ID and link for stage 2 is provided which includes payment of fees, choosing exam center and uploading documents. The completed application form is then submitted after filling and verifying all the details. A printout of it has to be taken for future use. Click on “Online Application for various examinations of UPSC”. Click on “New users” and the online application form will open. Personal Details: Name, Parent’s name, Date of Birth, Nationality, Gender, E-maid ID, Mobile number, Category, Marital Status an whether Physically challenged. Qualification Details: Relevant qualification (10th, 12thand Graduation), Board name, Year of passing, Division, % of marks, Total marks and Name of University. Submit the form. The link for below steps will be provided on the e-mail address or mobile number. Log in using the link and provide Registration number and Date of Birth. Pay the application fee (Rs 200 for General/BC and none for SC/ST/PH/Female). Choose the payment mode: SBI Net Banking/ Debit Card/ Credit Card or submit bank challan of INR 200 at the nearest branch of State Bank of India within 24 hours of generation of challan. Select the location preference (only one exam center out of 42 for Prelims and 24 for Mains). The entered preference cannot be changed later. The scanned image of photograph and signature in JPG format is submitted and the file size should not exceed 40 KB. The candidate has to verify whether all the details are correct. Then click on Submit. After successfully filling the complete application form, the candidate must take a print out of the form for future reference. The admit cards for Prelims were released from 11th December 2017. Admit cards for both stages can be downloaded online from the Official website. Go to the official link. 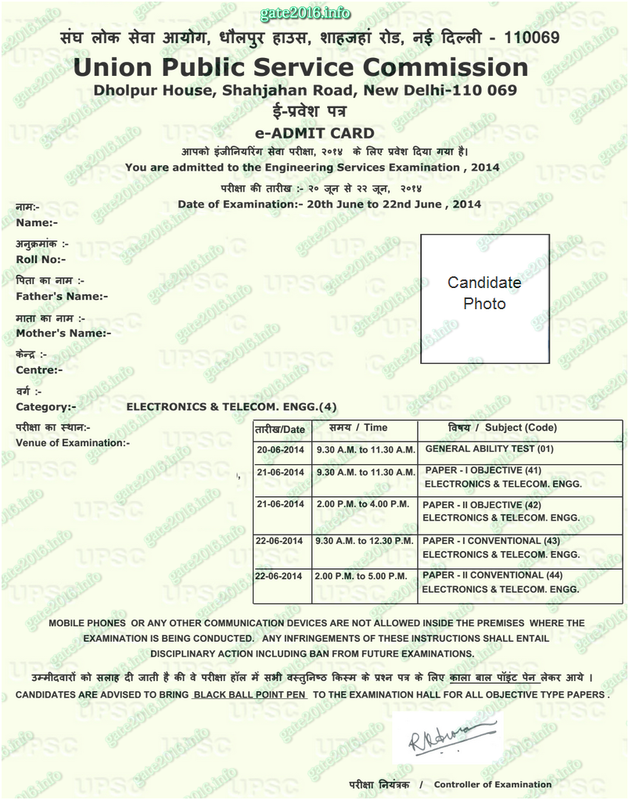 Click on Examinations tab and then e-admit cards. Click on the link for “UPSC Engineering IES 2018 admit card. Click on IES 2018 Admit Card. Read the instructions and click ‘Yes’. Enter your application number, roll number and date of birth. The Admit Card will appear and can be downloaded. The admit card for Mains 2018 for qualified candidates will be issued in online mode in April, 2018. Also after clearing the Mains, qualified candidates will receive and e-letter and Admit cards will be issued for appearing for the Personality test. They can be downloaded using the same procedure. After downloading the admit card, the details must be verified and in case of any discrepancy, it must be immediately reported to the Commission on the e-mail address [email protected] so that the commission is able to take decision on the matter. The UPSC helpline number for any problem is 011-23381125 and 011-23385271. A candidate must carry his/her admit card along with a photo identity proof (Aadhaar Card/ Voter ID Card/ Passport/ PAN Card/ Driving License) and IES Application Form otherwise he/she will not be allowed to take the exam. These questions can also be asked in IES interview. After the interview, final results are declared. Once the exam is over, the marks are calculated out of 1300. The cut off is decided stream wise, category wise and for each stage and is decided by the examination authority taking into consideration factors such as exam difficulty, number of appeared candidates, total marks of the exam and number of seats. The final score determines the post a candidate can apply for. There are four disciplines in which posts are available- Civil Engineering, Mechanical Engineering, Electrical Engineering and Electronics & Telecommunication Engineering. The final results will be declared tentatively in December 2018 and will be on the basis of all three stages. The candidates who qualify all the three examinations will be offered Rs 21,000 (Basic pay of Rs. 15,600 and Grade Pay of Rs. 5400) along with other incentives like DA, HRA etc. The gross amount in total would be Rs. 47,000 and soon it’s going to be 2.26 times due to 7th pay commission. The preliminary entrance exam for IES has been conducted for this year on 7th January 2018 and the notification for the same was released on 27th September 2017. The students can check the notification for next year on the official site of IES. The exam for IES entrance examination contains a common general ability paper and then papers on engineering specializations namely civil engineering, mechanical engineering etc. However, it is important to remember that there is no practical examination for any paper. Part A: General English. The question paper in General English will be designed to test the candidate’s understanding of English and workman like use of words. Part B: General Studies: This section will include questions on current events, general knowledge, basic understanding of science, history, geography . Cement: Compounds of, different types, setting times strength. Cement Mortar: Ingredients, proportions, water demand, mortars for plastering and masonry. Concrete : Importance of W/C Ratio, strength ingredients including admixtures, workability, testing for strength elasticity, non‐ destructive testing, mix design methods. Solid Mechanics Elastic constants, stress, plane stress, Mohr’s circle of stress, strains, plane strain, Mohr’s circle of strain combined stress; Elastic theories of failure; Simple bending, shear; Torsion of circular and rectangular sections and simple members. Structural Analysis Analysis of determinate structures—different methods including graphical methods. Analysis of indeterminate skeletal frames—moment distribution, slope‐deflection, stiffness and force methods, energy methods. Muller‐Breslaie principle and application. Plastic analysis of indeterminate beams and simple frames—shape factors. Design of steel structure Principles of working stress method/Design of connections, simple members, Built‐up sections and frames. Design of Industrial roofs. Principles of ultimate load design. Design of simple members and frames. Design of concrete and Masonry Structures Limit state design for bending, shear, axial compression and combined forces. Codal provisions for slabs, beams walls and footings. Working stress method of design of R.C. members. Principles of prestressed concrete design, materials, methods of prestressing, losses. Designs of simple members and determinate structures. Introduction of prestressing of indeterminate structures. Design of brick masonry as per I.S. Codes. Management : Bar chart, linked bar chart, work‐break down structures. Activity‐on‐arrow diagrams; Critical path, probabilistic activity durations. Event‐based networks, PERT network; Time‐cost study, crashing; resource allocation. Fluid Mechanics, Open Channel, Flow, Pipe Flow Fluid Properties, Pressure, Thrust, Buoyancy; Flow kinematics; Integration Flow equations; Flow measurement; Relative Motion, Moment of momentum; Viscosity, Boundary layer and control. Drag, Lift : Dimensional Analysis. Modelling Cavitation; Flow Oscillations; Momentum and Energy principles in open channel flow. Flow controls. Hydraulic jump. Flow section and properties; Normal flow. Gradually varied flow: Surges, Flow development and losses in pipe flows, Measurement, Siphons, Surges and Water hammer. Delivery of Power, Pipe networks. Hydraulic Mechanics and Hydropower Centrifugal pumps, types, performance parameters, scaling pumps in parallel. Reciprocating pumps, air vessels, performance parameters. Hydraulic ram. Hydraulic turbines types, performance parameters/controls, choice, power houses, classification and layout, storage, pondage, control of supply. Hydrology Hydrological cycle, precipitation and related data analysis, PMP unit and synthetic hydrographs; Evaporation and transpiration; Floods and their management, PMF; Streams and their gauging: River morphology; Routing of floods; Capacity of Reservoirs. As per the date sheet given above, results for the different round will be released separately. The results of the preliminary round will be released in April 2018, the results for mains will be declared in August 2018, while the final results after the PI will be released in December 2018. Students must keep checking the official website of UPSC. It is important to remember that this qualifying score is subject to candidates having scored having secured minimum 15% marks and PH candidate’s minimum 10% marks in each of the two objective papers. Candidates who pass the IES entrance exam are eligible for jobs under the Government of India in the department of engineering. The candidates who clear the exam join at the level of Assistant Executive Engineer in different organizations. After a couple of years of experience , she/he gets promoted .